He made it three legs in a row with a brilliant 120 checkout, before Anderson pulled a leg back despite another 180 from van Barneveld. The Scotsman won the next leg against the throw to put himself back on course for at least a draw, but ‘Barney’ wrestled back control by hitting back to back 180’s in an awesome eleven dart leg. Raymond van Barneveld produced a stunning fight-back to claim an 8-6 victory over Andy Hamilton in Exeter. 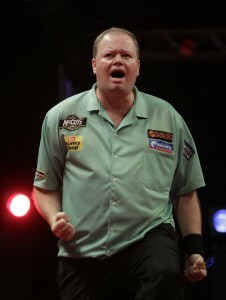 ‘Barney’ won the last four legs consecutively to seal the win, hitting five 180’s in the process. The Dutchman has been in fine form in the first few weeks of the McCoy’s Premier League season and is delighted to be silencing his critics. ‘Barney’ hit his first 180 in the opening leg, which he won before Hamilton levelled. ‘The Hammer’ then broke the Dutchman’s throw and promptly took a 3-1 lead. 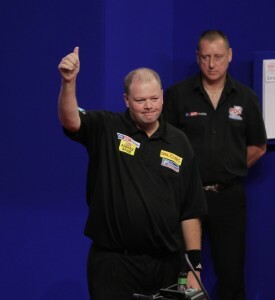 Van Barneveld held his throw before Hamilton did the same, despite ‘Barney’ hitting his second maximum. The five-time world champion hit double eight in the first leg after the break, to reduce Hamilton’s lead to 4-3. ‘The Hammer’ restored his two leg advantage by holding his throw before ‘Barney’ hit double ten to stay in touch. The 2012 World Championship finalist hit double top to edge further in front once more. ‘Barney’ then threw five perfect darts at treble twenty for the second time in the match, before hitting bull then double 16 for a sensational eleven darter. 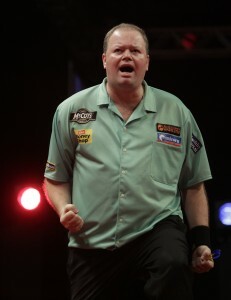 Still needing a break, at 6-5 down, van Barneveld turned up the heat on his opponent. The Dutchman hit his fourth 180 before hitting double nine to reach parity. He then held his throw to seal at least a point, hitting his fifth maximum in the process. ‘Barney’ completed the comeback by hitting double eighteen to break again, and grab his first win of the season.